January | 2014 | Ooh! Guess What! My Facebook feed is often populated with friends’ negativity about the Common Core State Standards. Common Core is turning our schools into data-run factories for mindless automatons. Common Core de-values correctness, making our kids sloppy and undisciplined. Common Core is too hard and makes kids cry. Common core makes kids pee their pants. Common Core requires 108 steps to complete a division problem. Hitler would have loved Common Core! I live the Common Core every day as a 7th grade mathematics teacher. I don’t hate it. Actually, I really value what it has brought to my teaching. It’s been difficult and stressful at times, as new initiatives are, but I’m optimistic that it’s going to help me become a better teacher and my students become better learners. All of the links above make flawed assumptions about Common Core. I’m getting pretty familiar with the middle-school Common Core math standards, and there are some things you should know before you share that viral video. The Common Core State Standards (CCSS) are a set of learning objectives. They lay out what kids should know and be able to do at each grade level. That’s it. They’re goals. They’re statements such as “Understand the concept of a ratio” and “Solve linear equations in one variable”. There are many ways to teach kids to reach those goals. The standards lay out some of the ways but give kids and teachers quite a bit of freedom. Thus, Common Core is not a curriculum, a mindset, a religion, a structure, or a test or a set of consequences for failing the test. It is a set of goals and that’s it. A common set of state standards was badly needed. Statistically, kids get a vastly different level of education depending on the state in which they live (see slides 22 and 23 here). Our educational system has produced consistently poor results for decades, and for those that think the educational system in our day was just fine – it wasn’t. One in three adults lacks basic numeracy skills – we’re products of a subpar educational system that has stagnated. Until recently, the educational standards for each state were almost all different, with some states significantly low-balling standards to make it easier to make adequate yearly process (AYP) for No Child Left Behind. States were feeling pressure or even being required to adopt new standards without the financial resources to do it, and so pooling resources in order to come up with a common set of state standards made a lot of sense. It was, and is, a reasonable response to start the course correction. We need to raise the bar, and so we’re doing it together. We struggled for quite a long time with what that standard means and what evidence shows you understand it. 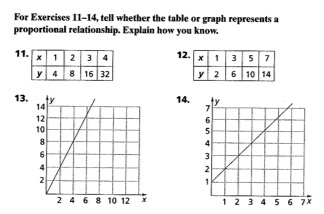 Is it enough to be able to answer questions like these, that show you tables and graphs and ask you to pick which ones are proportional? These questions technically meet the standard, but they feel like they don’t answer a bigger question of why proportional relationships are important. Why would you need to check to see if a relationship was proportional? Our department chair suggested that a student might be asked about three recipes and might need to know if they represented the same recipe but scaled up and down, or if they were different recipes. This is a good application of proportionality. Will these make the same syrup or different syrup? Which is the sweetest? Students can explain their reasoning in multiple ways, by dividing to make unit ratios, by graphing, by making a table, or making a diagram – any of those strategies would show the student understands how proportionality works. Our team felt we were starting to understand more about this thread. We looked together for other examples and brainstormed how we could teach students about proportionality. We found activities that would tie together multiple standards, where students could represent proportional relationships with equations. We talked about real-life examples where inexact measurements come out to be nearly proportional but not exactly – as in human body measurements, or this example about worms. We discussed common misconceptions students would have and how to start addressing them, as with students who had a weak understanding of place value and didn’t know what to do with decimal ratios, or misunderstanding the relationship between fractions and ratios. We created our unit plan together, and found some resources from teachers in other states who were teaching the same concepts. My point is that as we were using the CCSS to help our students become better learners, it was making us better learners. That exercise of working through the confusion around the standards was necessary and important. It still is, every day. The standards alone aren’t going to improve teaching and learning, so embracing the process is critical. A feature I like in the CCSS-M is the list of Standards for Mathematical Practice. It’s a list of strategies that make us better mathematicians – there are eight of them, including “Look for and make use of structure” and “Attend to precision” and “Use appropriate tools strategically”. It’s helpful to keep the list handy, posted multiple places in the classroom and tucked in your planner – so you can use it to identify strategies that will help students tackle tough problems. As students wrestle with open-ended word problems, they can be taught to be more mindful of pattern-finding, the use of technology, correct attention to an algorithm, estimation, and questioning themselves about the correctness of their equation or model. I like having common language to help students identify their thinking strategies and be mindful of their use. “You do a great job of coming up with a mathematical model, so where I want you to work is on really attending to precision and being careful of sloppiness along the way. Check the reasonableness of your answer when you are done. Does that answer feel right?” These strategies can be systematically worked on. I like that the CCSS puts them front and center. So living with the CCSS has made life harder, but has made teaching better. However, here are some features of the Common Core in middle school that are big problems for me. There is probably a misplaced standard here and there, and there are still too many concepts to teach and not enough time for all of it, but really those are small details that we can navigate around. My larger issues with the Common Core standards are these. CCSS.Math.Content.6.NS.B.2 Fluently divide multi-digit numbers using the standard algorithm. CCSS.Math.Content.6.NS.B.3 Fluently add, subtract, multiply, and divide multi-digit decimals using the standard algorithm for each operation. I don’t know that we need to ditch these skills but I wonder if the decision to include them was based on tradition instead of actual data. I wonder if we’d get more bang for the buck if we focused on mental math. I would like to see us question it more. 2) Technology plays a very small role in Common Core as well. In all of the middle school CCSS-M standards, technology is mentioned exactly TWICE. Adults use computers for math modeling. It’s how society interacts with math. Middle schoolers should be using computers often to model with mathematics and should know how to get the results they want from technology. It’s the 21st century, people. All that said, if we can get past the nonsense about fighting educational reform, if we can accept the premise that we really do have some re-thinking to do about how we approach mathematics in school, if we fully accept our role as developing critical thinkers, and if we can embrace the vast resource pool that’s just becoming available to use as Common Core comes online – we’ve got a good shot at making this thing work. There’s more to do in other areas, but this will start some terrific conversations.